The back is a very large muscle group which should be trained. If the back is not trained with the same intensity and frequency as the chest muscles, muscular imbalances will occur and injury is much more prevalant. Remember that the Erector Spinae muscles are actually 'deep' muscles and aren't shown in the image. 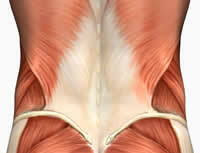 The function of the back muscles are to 'pull' towards the body. 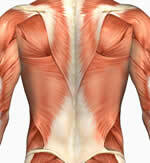 There are many muscles that make up the 'back'. Hypertrophy back training should always be started with a major compound exercise such as deadlifts or barbell bent over rows. The lower back is made up of a group of muscles that connect to many parts of the ribs. Everyone should be strengthening the lower back as even desk jockeys need to keep it strong to prevent pain. Training your lower back and abdominals should have equal importance. Weak abdominals WILL effect your lower back and you may have problems. There are many exercises you can perform without weights such as ball back hyperextensions and just back hyperextensions on a mat. - Cross one arm in front of your body.